← New Year’s Challenge – What’s the Main Course? Most people associate a gift of chocolate with Valentine’s Day. While a box of chocolates is the traditional sweet, whether it’s dark chocolate bark or chocolate truffles, I intend to make my Valentine a special dessert following a homemade meal. Below are three of my favorite desserts that are rich and comforting yet relatively simple to make. You can prepare this recipe in a pie dish or you can use ramekins for individual servings. I prefer the latter for ease of serving and a more interesting presentation. Preheat the oven to 350 degrees. Beat the sugar and eggs together, then add the chocolate and other ingredients. Put the ricotta in last and mix thoroughly. Butter the ramekins and fill them with the mixture so it reaches about ¾ up the sides of the ramekins. Place the ramekins in a baking dish and add enough hot water to the dish to come about ½ the way up the sides of the ramekins. Cover the entire dish with aluminum foil and bake for 25 to 30 minutes or until it looks like the mixture is cooked through. Remove the foil and bake for another 5 to 10 minutes. Test doneness by putting a toothpick in the center and making sure that the center is no longer liquid. Remove the dish from the oven and carefully remove the ramekins from the water bath. Chill the ramekins before serving and top with fresh berries. Preheat the oven to 350 degrees. Beat the eggs. Mix the eggs, condensed milk, whole milk and vanilla (this is the flan mixture). Heat a saucepan over medium-low heat and add the sugar and water. Using a wooden spoon, stir the sugar and water mixture until the sugar melts and turns a light brown color (this is the caramel). You may need to add more water to achieve a caramel consistency. Remove the saucepan from the heat and pour the caramel into a buttered 9 inch round pie dish. Then pour the flan mixture into the mold and cover tightly with aluminum foil. Place the mold into about 1½ inches of hot water in a larger pan. Bake for about 1 hour. 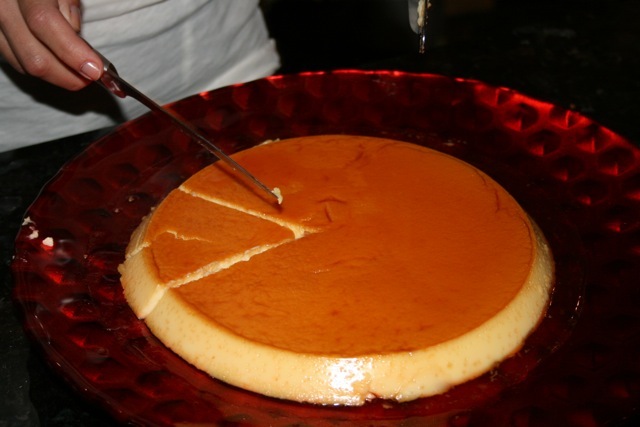 To test, insert the tip of a knife in the flan. If the knife comes out clean, then the flan is finished. Chill the flan before serving. To serve, place fresh berries on the side of the flan. Soak an unglazed clay pot, such as a Römertopf, in cold water for 15 minutes and then drain the pot. Add the rice, sugar, vanilla, milk, coconut milk and cream. Cover the clay pot and place it in a cold oven. Set the oven to 350 degrees and cook for 1 hour. Remove the lid, stir the pudding, then replace the cover and cook for 30 to 45 minutes until the rice is tender. Remove the lid and stir the pudding. Sprinkle the pudding with the shredded coconut and bake uncovered for 15 minutes. Serve at room temperature. Happy Valentine’s Day, and save some room for dessert! This article originally appeared in the February 2014 issue of The Journal of the Delaware State Bar Association, a publication of the Delaware State Bar Association. Copyright © Delaware State Bar Association 2014. All rights reserved. Reprinted with permission. This entry was posted in Uncategorized and tagged Cheesecake, Chocolate, Coconut, Dessert, Flan, Food, Recipe, Rice Pudding, Ricotta, Sweets, Valentine's Day. Bookmark the permalink. They all sound wonderful! Am I the Valentine?